The cruise provides plenty of photo opportunities so keep your camera handy! 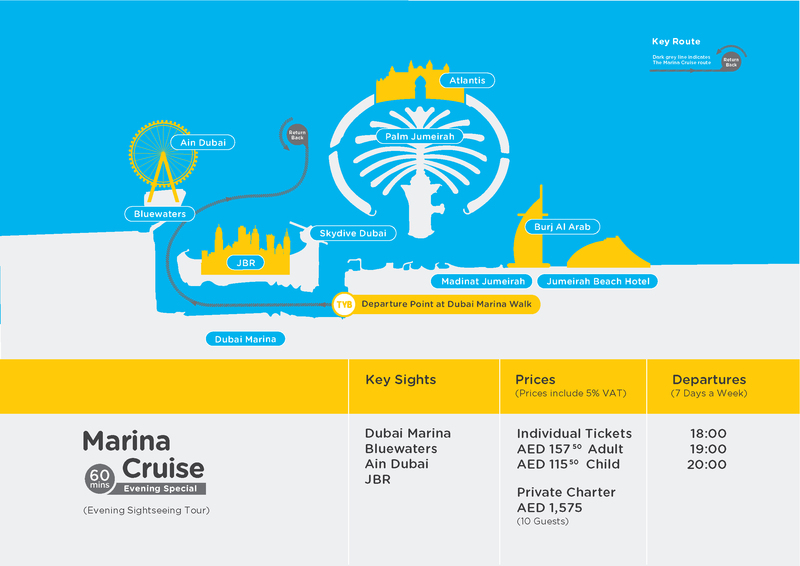 Enjoy a relaxed cruise and a slow-paced panoramic tour of the Dubai Marina. The Dubai skyline with the marvelous skyscrapers looks stunning from the water. You will be accompanied by an English speaking guide during your 60-minute cruise, who will point out the major landmarks of the Dubai Marina. Relax aboard our 60 minutes Evening Sightseeing Tour and cruise past Dubai Marina skyscrapers, the new Ain Dubai and the JBR beachfront as day turns to night. To begin your Dubai Marina sightseeing cruise, you will board the yellow rubber boats from Dubai Marina Walk, opposite the Spinney’s building. The tour is perfect for those who are short on time and want an enjoyable experience at the chic and urban Dubai Marina. Relax aboard our 60 minutes Evening Sightseeing Tour and cruise past Dubai Marina skyscrapers, the new Ain Dubai and the JBR beachfront as day turns to night. The boat will slowly cruise through the Dubai Marina as your English speaking guide will point out the famous landmarks of the most spectacular marina in the world. The stunning views of the skyscrapers from the boat is quite exhilarating at any time of the day. After sailing for 60 minutes, your sightseeing cruise will end at the point of origin. For safety reasons women at any stage of pregnancy are not allowed to take the tour.